The primary texts of ancient history, even in translation, can be difficult for students to read and comprehend. When writing styles, vocabularies, or cultural references have changed, primary documents only a few centuries or decades old can seem almost as inaccessible. How can we help students make sense of these sources? The themes we hope students will consider through their encounters with these texts may remain out of reach unless we get students’ minds actively involved—both in close examination of the language and in bringing back to life not only the characters, but also the settings and events these documents record. In this second post, I will discuss a strategy our collaborating teachers and I have come to rely on to engage students in this way. We choose a section of text that describes something physical or material or visual—a setting, an object, or even an event—and we ask students to draw it. For our industrial revolution project, for example, we chose Marshall Strode’s butter transporter, a specially designed container that protected his high-quality butter on its lengthening trips to market. For Ancient Greece, we chose the bridges — described by Herodotus (VII: 20, 32-36) — which Xerxes’ engineers built to allow his army to cross the Hellespont and to march from Asia into Europe. The challenge to represent a difficult description through drawing helps students enter into closer relationships—working relationships—with a text. As students work to understand the text fully enough to reconstruct in another medium what is described, and as their drawings begin to take shape, the task itself encourages them to talk with one another. Comparing each other’s drawings—and, even before that, comparing questions about what is described and how to represent it—leads them to compare different interpretations of puzzling phrases and sentences, and ultimately to better understand them. Sometimes we structure opportunities for these comparisons more formally, by arranging gallery walks. Students lay their work on their desks, or we hang it on the wall, and people are free to walk around the room to view and discuss the works-in-progress and, eventually, the finished drawings. We ask the students what they notice about the work, encourage them to say more about the similarities and differences they observe, and invite them to talk with each other about how one or more drawings (or details within them) relate to the text, and about how they decided what to draw to represent particular words and phrases. Both the drawing task and these informal or more formal comparisons help reveal to us as teachers the students’ evolving understandings of the text. The drawings elicit their observations and even permanently record them in visual form. Often, we can trace changes in their thinking through erasures in the drawing itself, as well as through small group or gallery walk conversations. The drawing task, along with the working relationships with the text it encourages the students to develop, also serves two key purposes for the students’ learning. First, it places the text in its proper position as a source rather than an authority. It puts the students in the positions of scholars, where they are allowed and expected to create from their interaction with the text something useful and interesting to other readers. It assigns responsibility to the students’ minds and imaginations to interpret the text and to bring its static record to life in their artwork and their conversation. Second, the task helps the students develop familiarity with the text, and with the setting or object or event it describes. And it helps them reach a deeper level of familiarity than simply reading or discussing the text could support. When they encounter related settings, objects, or events, in other texts or other kinds of sources, this deep familiarity prepares students to recognize the resonance (and dissonance) among them, and to begin to articulate the parallels (and conflicts) they notice. And that resonance and those parallels (and that dissonance and those conflicts) give rise to the important themes of the unit—the overarching themes that we as teachers so want students to be able to discuss and understand. Intertwined with the massive and inventive project of Xerxes’ engineers are the cruelty and coercion of their single-minded dictator, and his angry intention to dominate both the waterway and the land he is about to enter. As Aeschylus (another ancient writer, in another passage we read) puts it: “They’ve crossed the strait / that honors Helle / by binding their ships / and clamping a bolt-studded road— / a yoke / hard on the Sea’s neck!” Entering a land where rivers are worshipped as gods, Xerxes requires even the Hellespont to submit to him. 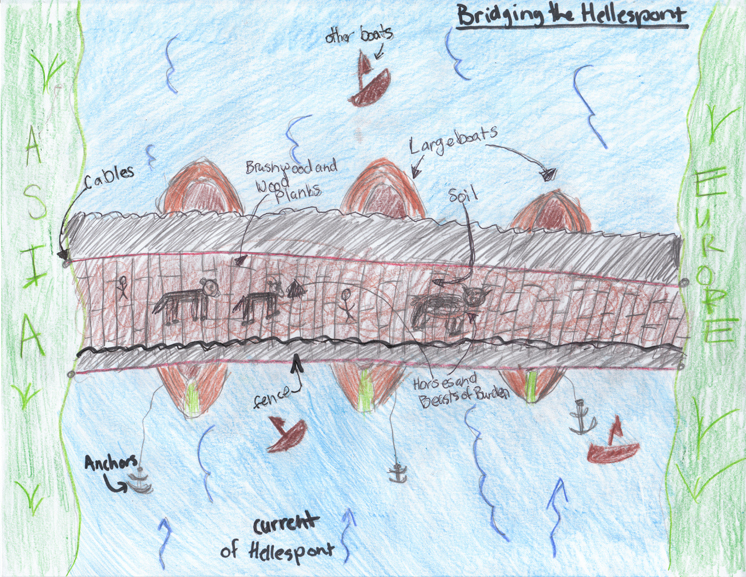 “A yoke / hard on the Sea’s neck!” The bridges are a productive focus for the drawing task in part because—in a sense—the bridges are Xerxes’ requirement that all submit to him, crystallized in material form. 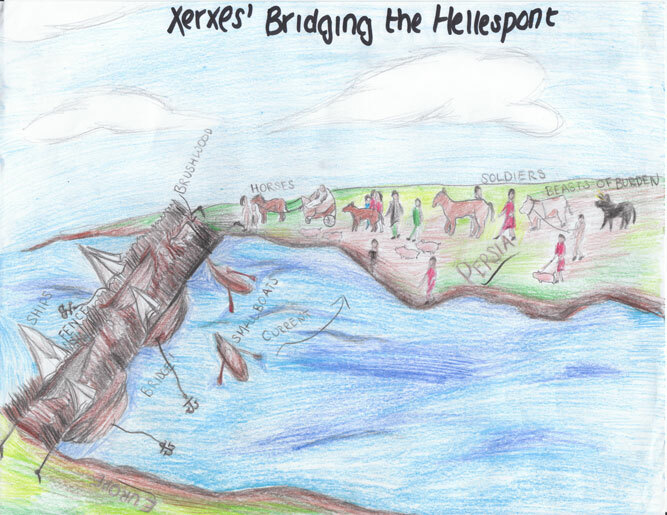 As the students’ efforts to reconstruct the bridges help them focus on and better understand the texts, then, those same efforts also help them think about Xerxes’ obsessive determination and apparently invincible power to bridge the geographical gap between Asia and Europe and to bring Greece under his rule. They set the stage for understanding the deep cultural and political differences between Xerxes and his vast army of subject peoples and the small, independent Greek city-states planning the defense of their homeland. Concentrating on the construction project at the Hellespont helps the students develop familiarity not only with the bridges themselves, but also with the tangible separateness of Asia and Europe and with the form of leadership—and the style of the individual ruler—that spurred the engineers to their all but impossible achievement. By the time we reach the Battle of Thermopylae, this familiarity has prepared the students to consider the differences between the Persian form of leadership and that of the Spartans—and how Xerxes’ position, and his attitudes and assumptions (for example, “If the Spartans were under the rule of one man, as my soldiers are under my rule, the Spartans would fear that man and be better able to go out and confront larger armies”), predispose him vastly to underestimate the danger the three hundred Spartans can pose to his army. Just as these specific understandings support and are supported by one another, they and others like them will also help build overarching understandings of the further unfolding, the outcome, and the significance of the Persian Wars. Alythea McKinney is the director of Critical Explorers. I am a reading teacher at a small school in the Caribbean. Since Greek history isn’t part of the curriculum I am thinking how I can use this study framework for our own history project. These students are rarely engaged at this level, so this could and will be a challenging and fun project for my reading students. Thanks so much!